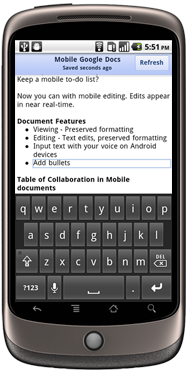 One of the most sought for features of the Google Docs mobile interface has always been support for editing documents. As its stands now, you get read-only access, and any editing functionality can be achieved by using external apps, which is far from ideal, especially for quick edits. Note that I'm talking about documents and not spreadsheets here - those have been editable for quite a while now. Thankfully, today Google announced that proper document editing support is finally ready for your consumption and will be rolling out in the next few days. One really cool part about the new capability is that it's near real-time, meaning whatever you edit in your mobile browser will be uploaded back to the server almost instantly, keystroke after keystroke. Very cool for those spotty connections. Unfortunately, only Android 2.2 Froyo devices will be supported, and only English-language users will be able to enjoy the new functionality at first, but Google promises more languages soon. To jump into action, just head over to http://docs.google.com on your mobile device.